Pioneer might be the first name you think of when it comes to receivers, headphones and speakers, but it might soon be the first name you think of when it comes to media players, too. The company's home entertainment, which was sold to Onkyo in 2014, made a splash at the Custom Electronic Design & Installation Association (CEDIA) Expo this afternoon when it unveiled three new hi-fi products, including a new Android Lollipop-powered music player. 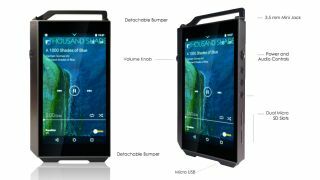 The device is called the XDP-100R, and will be the company's first hi-fi player released in the US (it's previously released one on the company's home turf in Japan called the NSP-D10P). Sporting a 4.7 inch touchscreen display, the device supports high res audio formats up to DSD 11.2MHz, 384kHz/24bit FLAC/WAV audio files - a slightly better standard than what HD streaming sites like Deezer and Tidal currently support. On paper, the device looks like it could offer strong competition for the other hi-fi players on the market, the Sony NWZ-ZX1 and the Pono Player. Though admittedly 32GB of internal storage seems a bit on the low end considering that FLAC files typically range from around 20MB to 50MB in size. But a hi-fi player wasn't Pioneers only trump card at the show. It also announced the SE-MASTER1 "reference grade" headphones and SX-N30 hi-fi receiver that supports WAV, FLAC, Apple › Lossless, WMA Lossless, WMA, AAC, OGG Vorbis and MP3 files. The XDP-100R media player is expected to cost $700 (around £450, AU$960), while the headphones and receiver will retail for $2,500 (about £1,600, AU$3,500) and $600 (about £400, AU$800), respectively.